Emilian Kowcz, was born in Ukraine on August 20, 1894, in Kosmach near Kosiv. His, was a family that had produced several priests. His father, was Father Gregory Kowcz, a Greek Catholic parish priest. Blessed Emilian completed school in Lviv, and then from 1905 to 1911, he studied theology in Rome. In 1911 he married Maria-Anna Dobrzynska, and the next year he was ordained a priest. There was a war between Poland and the Ukraine, which was a multi-sided war that saw seven different nations take the battlefield. In this war, Father Emilian served as a military chaplain from 1919-1921. He had said at the time, “I know that the soldier on the front line feels better when he sees the doctor and the priest also there . . You know, lads, that I am consecrated, and a bullet doesn’t take a consecrated man easily.” He was captured, held prisoner briefly, and then released and appointed parish priest at Peremyslany, a small town 30 miles from Lviv. His activity then was devoted to parish life. He cared for the spiritual, material and physical needs of his parishioners. He organized Eucharistic congresses, bought shoes and books for poor children, supported local cooperative movements and the Ukrainian independence movement. This brought him attention from the local Polish administration, who searched his house over 40 times. He was fined and imprisoned in a monastery. He and his wife had six children of their own, and many times gave shelter to orphans as well. Father Emilian organized help for Polish widows and orphans. In the first two years of Soviet occupation, the secret police murdered or deported over 300,000 persons from west Ukraine. In 1941 mass arrests were carried out in Peremyslany, including Father Emilian and two of his daughter’s. Miraculously, they escaped just as the Nazi invaders reached their town, but, as Father Emilian Kowcz celebrated his first Mass back in his parish, the news arrived that all of the other prisoners had been killed by the retreating communists. Many of the Ukrainian people hoped that Hitler would liberate them from the Bolshevik oppressors, and grant them some measure of independence, but, those hopes were short lived. Father Emilian urged the young people to not become involved in criminal deeds and to resist the urging of anti-semitism by the Nazi’s and their newly formed police force under Nazi control. Father Emilian never ceased to condemn publicly the deeds of the Nazi Fascist regime, which treated the Slavs as sub-human and began deporting them to German factories and labor camps. The treatment of the Jews became a very serious matter. A detachment of the SS drove some Jews into a local Synagogue, and began throwing firebombs inside with the intention of burning them alive. 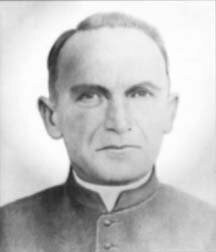 Somehow made aware by some Jews of what was taking place, Father Emilian, along with some of his parishioners, rushed to the Synagogue, and blocked the doors preventing the Nazi’s from throwing more firebombs inside. Fluent in German, Father Emilian shouted at the Nazi’s to go away, and by another miracle, they did. Father Emilian and the parishioners then went into the already burning building, and saved as many as possible. The Jews were the majority of the population of Peremyslany, and any attempt to save Jewish lives en masse from the Nazi’s was impossible. Some of the Jewish population came to Father Emilian asking for baptism, in the hope that would save them from Nazi extermination, and he catechised and baptised them, at first individually. As the Nazi persecution became more intense, a group representing 1,000 Jews came to Father Emilian asking for baptism. Father Emilian then consulted Archbishop Andrei Sheptytsky (who was sheltering over 1,000 Jews himself) as to what action to take. As time was getting short, on his return, Father Emilian then administered a short catechesis and mass baptism. This was entirely against Nazi law, but, Father Emilian ignored their warnings, and further, after the closing of the ghetto, he applied to the Nazi’s for permission to enter the ghetto to baptise any who desired it. The records indicate that the newly baptised Jews formed their own Christian community even within the ghetto. Father Emilian even wrote a letter to Adolph Hitler denouncing the Nazi crimes! “I thank God for His goodness to me. Apart from heaven, this is the one place where I wish to remain. Here we are all equal: Poles, Jews, Ukrainians, Russians, Latvians and Estonians. Of all these here I am the only priest. I cannot even imagine how it would be here without me. Here I see God, who is the same for us all, regardless of our religious distinctions. Perhaps our churches are different, but the same great and Almighty God rules over us all. When I celebrate the Divine Liturgy, they all join in prayer. . . They die in different ways, and I help them to cross over this little bridge into eternity. Is this not a blessing? Isn’t this the greatest crown which God could have placed upon my head? It is indeed. I thank God a thousand times a day for sending me here. I do not ask him for anything else. Do not worry, and do not lose faith at what I share. Instead, rejoice with me. Father Emilian’s health began to deteriorate and after Christmas 1943, he became seriously ill from stomach problems he couldn’t hide. He was sent to the camp “hospital” where it was well known by his fellow prisoners that healing treatment was extremely rare, and that the Nazi “doctors” helped speed death along by injection or starvation. Father Emilian was last seen by his fellow prisoners in the spring, but, afterwards, they did not know what became of him. It was not until 1972 that his daughters managed to obtain his death certificate, where the records indicate that he died of infection and inflammation to his right leg that blocked circulation. Some records also indicate that he was gassed and burned in the ovens of the Majdanek concentration camp. Father Emilian Kowcz died on March 25, 1944. Blessed Father Emilian Kowcz through his example of faith and courage, showed all what Love of Christ, Faith in Christ, and Hope in Christ is, and how that love, faith, and hope is to all people, no matter who they are, or what their station in life. Copyright © 2006 Steve Smith. All rights reserved.